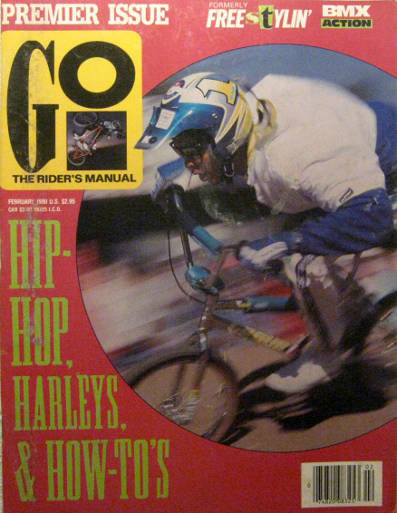 Freestylin' magazine was combined with BMX Action to become "Go: the rider's manual" in 1989. 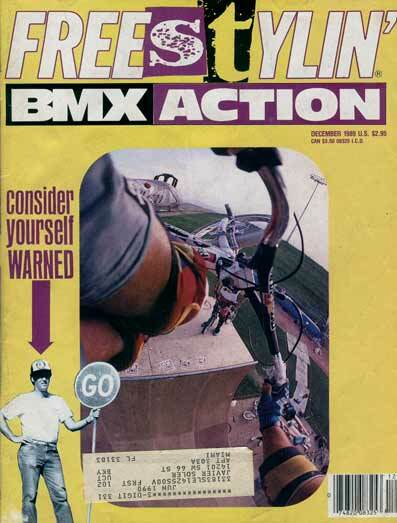 Exerpt from the Editor that can be found in issue 1 explaining the first covers: We wanted to make sure everyone would recognize us on the newstands, so until the february 1990 issue, you'll be seeing both the FREESTYLIN' and BMX ACTION logs on the front. If you currently subscribe to FREESTYLIN' or BMXA, you will now be receiving GO. Editors: Mark Lewman, Mike Daily. Publisher: Bob Osborn, Wizard Publications. 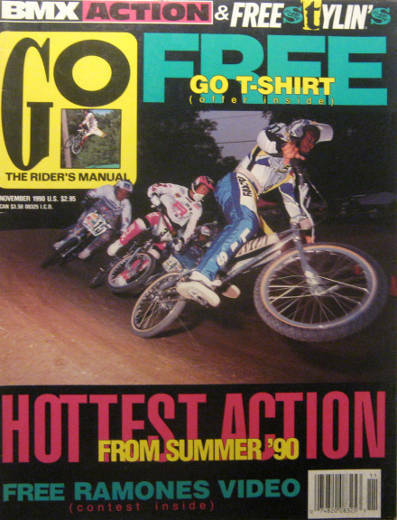 Mark Noble, Ride BMX UK, december 1993: The cocktail of BMX A and Freestylin' although the previous editorial people had flown the nest ; Mike Daily was now in charge, Brad McDonald was shooting, and Jeff Tremaine was art director [before moving on to Big Brother]. Plenty of soul and good stuff inside, and indeed things looked good for the skeleton that remained from Wizard's original staff list. GO continued to fuel on the fire, only the industry didn't get it and pulled their money, hence it's now dead. Tim Fuzzy Hall cancan seat grab on the cover. Photo by Spike Jonze. Matt Hoffman interview and pictorial. North Coast Freestyle/NBL War of the Stars in Rochester, NY. Pull-out mini poster of Craig Campbell. Features articles by Lew, Scott Towne, Daily, Andy Jenkins, photos by Spike and more. 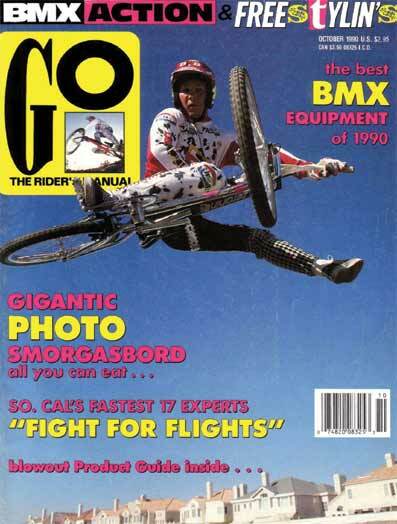 Matt Hoffman snapping the shot from about 8 feet out on the cover. Greg Hill interview. greg goes through every year of his career in detail. IBMX world cup in Australia. Eric Emerson on the cover. 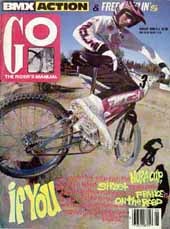 This is the premiere issue of "GO" BMX Action and Freestylin' magazine combined 3 issues before this one, but this is the first issue to carry the "GO" logo. Matt Hoffman sequence: six feet air to disaster. How to Lookback by Dave Voelker. Trent Chavez on the cover, Dennis McCoy in the box. 2-Hip Meet The Street finals, Oregon. AFA Masters finals, LA, CA. 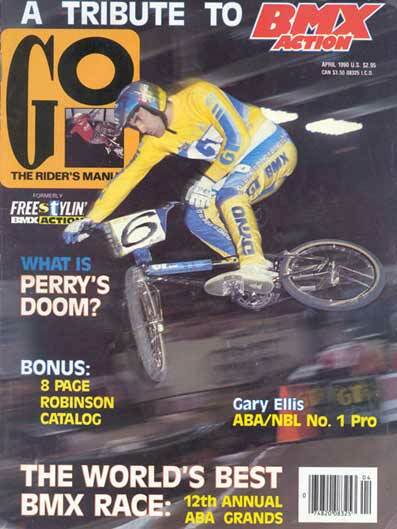 Gary Ellis on the cover. Matt Hoffman in the box. 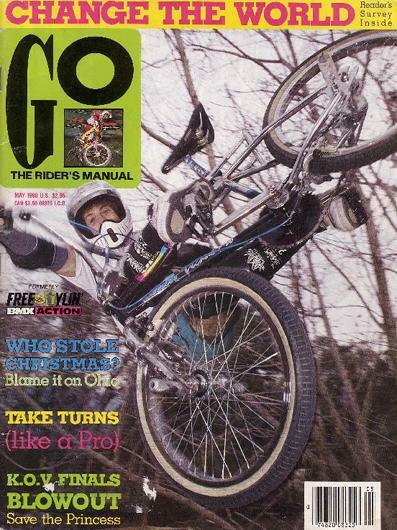 Dennis McCoy pulling air at the Dominguez ramp on the cover. Photo by Spike Jonze. Ad with GT Team rider Dave Mirra. 2-Hip King of Vert Finals. NBL Christmas National, Colombus, Ohio. Greg Hill and Brad Blanchard on the cover. Box contains Perry Mervar. 80 pages. Dog bites by Chris Moeller. 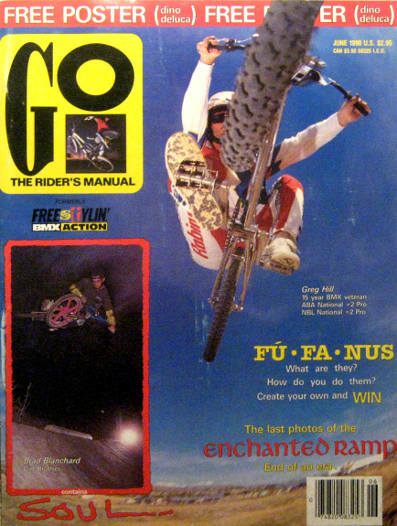 Directions: How to Fufanu by Dennis McCoy, Nose wheelie by Rick Moliterno. 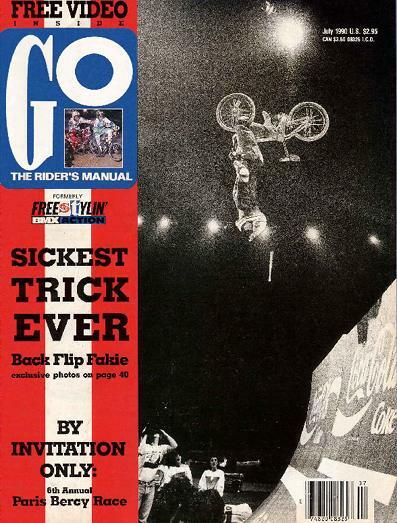 Matt Hoffman backflip in Paris on the cover. Photo by Spike Jonze. Trevor Meyer riding a pool ? Billy Griggs at Eric Carter's backyard on the cover. Photo by Spike Jonze. Incoming (letters), Approved credit. 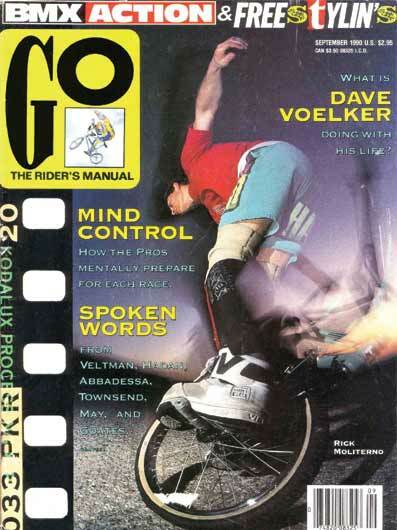 Mit Yaled, GO august 1990: Dear Go, I often wonder whilst visions of Drob Meyer and Joe Johnson cascade through my mind, if we as riders really give ourselves enough credit. The next time you get bummed trying to learn a new trick or are having a bad day, just take time and realize what you can do and realize how incredible it is. I mean, it's not every human who con balance, coast scratch, sprague, kick, and glide a bicycle in tight circies or fly down a hill in a hang five at warp 40. Yes, we who ride are superhuman... or have I been reading too much Bloom County ? Lew: I don t know how about being superhuman but I will say that there are things being done on bikes these days that the average person couldn t even dream of doing. Things a lot of riders take for granted. And like you said Mit the key is realizing what you can do not what you can't. NBL Easter Classic, Sarasota, FL. Inspection. Tioga Competition VIII tires, Kastan Uni-Blade strut, Vision Street Wear 15010 shoes and All-terrain Jive handles. Trend Ironman contest, Austin, Texas. ABA/Redline U.S. Nationals, Lemoore, CA. Spring Break GT clinic tour. Stop. Tim Fuzzy Hall 360. Rick Moliterno halfpacker on the cover. Gary Ellis in the box. Photos by Spike Jonze. Then and now: John Ker. Dog Bites: Chris Moeller about summer tours. A day in the life of Dave Voelker. How to Roly Poly (rolling catapulte) by Dennis McCoy. ABA/GT Spring Nationals Stockton, CA. New kids on the block: Matt Hadan, Steve Veltman and Kenny May. Matt Hadan one footed and flat in Huntington Beach on the cover. Carl Marquardt letter where he promised $100 to the first person who can do what he had come to think of as a flair -an aerial with a backflip thrown in. Brad Blanchard and Kiyomi Waller bios. Directions: No-footed straddle roni by Eric Emerson and Kickout with Dave Cullinan. Cover: AA Pro racing, Rockford. John Paul Rogers in the box. Perry Mervar standing on the rear pegs straight to grip stand sequence. ABA Midwest Nationals Rockford, Illinois. Trend/2hip KOV 1990 round 1 Indianapolis. Tim Hall's Mongoose Solution XL. 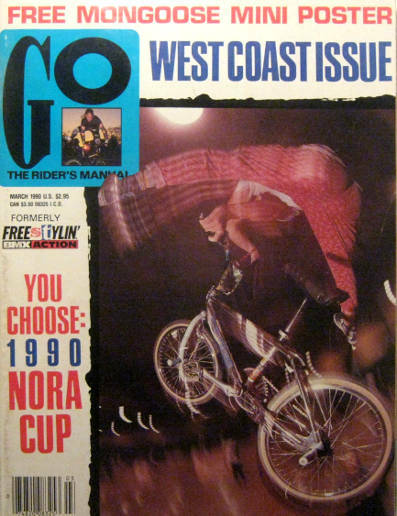 Brian Blyther can-canning at Jake's ramp in Hermosa beach, California on the cover. Random disruptive sequence: pulled 900° by Jay Miron. Directions: No hander by Jon Byers. Bios: Sean Leslie and Ryner Matthews.